The Best Hog Roasts In North Wales! 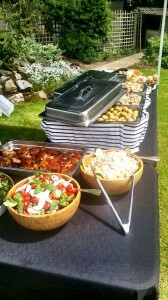 With Spitting Pig North Wales you’re guaranteed catering results for your party, corporate or wedding event. Our many years of catering experience is used to bringing out the best in any event. Utilising firsthand experience of making hog roasts at thousands of events our team will recognise your catering vision and use the knowledge we have to guide you towards North Wales’ greatest, most irresistible hog roast Bangor catering experience, using only the finest local Welsh produce. To fully understand what makes hog roasts the first catering choice for so many people you have to appreciate the full joys and excitement of the hog roast experience, not just the jaw dropping taste of the finished, plated roast. As guests arrive at an event the first impressions are crucial, you can’t afford for people to turn up and be put off or underwhelmed in anyway, those first few minutes really matter. Hog roasting makes the most of introductions, a hog roast in Dolwyddelan overwhelms with a fully sensual experience to get your party, wedding or corporate event off to the best possible start. Picture the scene… You’ve finally found the venue, you make your way to the event and before you even get inside you catch wind of a mouth watering smell, the fragrance of the spit roast that’s stretching further than the eye can see! Already, and possibly even before you’ve reached the area of the event, the hog roast has made an impression on you. You might not even know that it is a hog roast, but the aromatic qualities of the roast hog have already got acquainted with you. Wondering what the amazing smell is it becomes clear as you enter the venue and you’re greeted by the spectacle of a whole pig being hog roasted by our hog roast chef and that’s undoubtedly the best bit. The hog roast Llandudno, and these areas, Wrexham, Denbigh, Colwyn Bay, Bangor, Conwy, Ruthin, Rhosllanerchrugog, Llangollen, llandudno and Anglesey display is breathtakingly good; when your guests see it they’ll be drawn in and absolutely enthralled by their hog roast experience and be raring to go for your event. The glorious sight and smell of the Hog Roast North Wales catering service will have them hooked. By the time the hog roast Anglesey meat has been cooked and is ready to serve your guests will have already had a great experience and be chomping at the bit to get their share of a hog roast serving. Without error the experienced hog roast chef will tear off sheets of crispy crackling, collecting munificent portions in a large dish, while then doing the same with superfluously succulent carvings of tasty, textured meat. The chef will then serve a sumptuous mix of both on bread rolls, finished with chef-created special pig stuffing and apple sauce from the finest apples in Wales. This appetite whetting experience is waiting for you and Spitting Pig North Wales will be happy to oblige your event needs with a mighty serving of pig roast sandwiches or spit roast buffets and meals.